Prime Minister Junichiro Koizumi of Japan: We invited all of the leaders of the Association of Southeast Asian Nations (ASEAN) countries to Japan this time and held this commemorative summit of Japan and ASEAN countries. I understand that this is the first ASEAN summit meeting to be held outside the ASEAN region in a dialogue partner country. This indeed has been a historic meeting, and this indeed has been singular honor for Japan. In the meeting, we engaged in a very candid exchange of views. To date, Japan has attached importance to ASEAN. This building on the results of Japan-ASEAN relations achieved over the past three decades, I expressed my clear commitment that this policy of Japan attaching importance to ASEAN will remain unchanged. This stance was welcomed by the ASEAN leaders. Over the past two days, we discussed the future of Japan-ASEAN relations from broad perspectives and we reaffirmed that we shall further develop our relations as sincere and open partners that act together and advance together and make sure that our relations will continue to grow ever closer. Today we signed the Tokyo Declaration in which we evinced the direction we should take in Japan-ASEAN relations in the new era. The plan of action that accompanies the Tokyo Declaration lists more than 100 concrete cooperative measures that range from economic and development areas to political security and social and cultural areas. When these measures are implemented, the relations between Japan and ASEAN, the bond that ties Japan and ASEAN, will grow even stronger. In response to fervent calls from ASEAN countries, Japan this time signed the declaration of the intent to accede to the Treaty of Amity and Cooperation (TAC) of Southeast Asia. This again is nothing less than an expression of Japan's determination to act together and advance together with ASEAN. ASEAN needs to integration and continue to develop in the interest of Asia's peace and prosperity. Japan made clear from this perspective its stance that it will continue to attach importance to development cooperation with ASEAN. Especially in human resources development, I explained that Japan is prepared to provide cooperation amounting to more than US$1.5 billion over the coming three years. As a result, the exchanges of people between Japan and ASEAN involved in human resources development is anticipated to reach 40,000 persons during the same period. With regard to the Mekong sub-region development, we shall note the step-up of cooperation integrating economic cooperation and trade and investment promotion. We also explained that we anticipate cooperation amounting to US$1.5 billion during that three-year period. We believe that an economic partnership agreement (EPA) between ASEAN countries and Japan is a demand of the times and we need to achieve that with a sense of speediness. I believe that to launch negotiations with the Kingdom of Thailand, the Republic of the Philippines and Malaysia was a major step forward as we try to move ahead with economic partnership with ASEAN as well. We also agreed that we need to strengthen our regional cooperation in response to transnational issues such as terrorism, piracy and trafficking in persons, and make peace and stability in this region more certain. Thus we need to further strengthen broad-ranging partnership between Japan and ASEAN and play a central role in building an East Asian community. I believe the commemorative summit this time was indeed a very fruitful one and I am convinced that historians in the future will see this as a historic meeting symbolizing the Japan-ASEAN relations that have progressed to a new phase and the ever-deepening regional cooperation in East Asia centering on these relations. President Megawati Soekarnoputri of the Republic of Indonesia was kind enough to co-chair the meeting this time. I would like to express my heartfelt gratitude to President Megawati and also to the kind cooperation and friendship expressed by the ASEAN leaders. Also, I would like to say that the meeting concluded smoothly and was a very fruitful one thanks to the outstanding chairpersonship of President Megawati. Thank you very much. 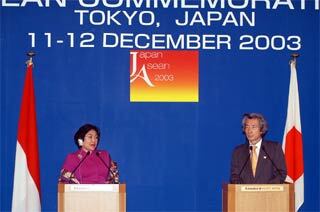 President Megawati Soekarnoputri of Indonesia: Thank you very much, Prime Minister Koizumi, for giving me the floor. Let me begin by expressing our thanks to the Prime Minister of Japan for hosting this historical summit between ASEAN and Japan. We have had very fruitful discussion on the overall ASEAN-Japan relations as well as on the future direction of our relations. In the past three decades, ASEAN and Japan have developed a mutually beneficial partnership and cooperation which continue to deepen and widen. Let me reaffirm that the ASEAN-Japan long-standing relations and cooperation have contributed significantly to the peace and prosperity of the people in Southeast Asia as well as in the wider region of East Asia and the Asia-Pacific. Although our relationship is in a good state, nevertheless the dynamic global and regional environments require ASEAN and Japan to work together even more closely. Globalization and greater interdependence among countries in the world presented ASEAN and Japan with new opportunities and new challenges. To take the opportunities and overcome the challenges, we will further strengthen our relations in a comprehensive manner. Through the discussions, we note a desire to consolidate our cooperation in the political and security fields. International terrorism poses a deadly threat to our regional security, and therefore, we must work together to overcome this threat. We also welcome the plan of accession of Japan to the Treaty of Amity and Cooperation. We believe that by Japan sharing these common rules of good conduct, it will greatly contribute to the maintenance of peace and stability in the region. We have also discussed ways and means to foster closer economic cooperation between ASEAN and Japan. Japan has been and will continue to be the most important economic partner of ASEAN. We therefore agreed to develop a broad-based economic partnership underpinned by the ASEAN-Japan Comprehensive Economic Partnership Agreement to develop deeper understanding among our people, and we agreed to further promote greater people-to-people interaction through education and exchange of people. ASEAN and Japan will also work closely in promoting East Asian cooperation through the ASEAN+3 cooperation framework with the ultimate aim to develop an East Asian community. Considering the progress of our relations, we commit ourselves to deepen and expand our partnership as outlined in the Tokyo Declaration and plan of action which we signed this afternoon. We believe that this declaration, its plan of action and its strengthened implementing mechanism will serve as foundations for other future cooperation, especially to face the new challenges in the 21st century. Thank you. Mr. Kawakami, Mainichi Shimbun: As one factor in the background to the holding of this conference, it was just said that there was the rising influence of China in the region. I would like ask both leaders in connection with the meeting this time, what are your views of China's influence in the region? President Megawati: I do not think the decision to hold the summit was influenced by the expansion of China's influence in the ASEAN region. ASEAN-Japan relations have their own dynamics as do ASEAN-China relations. I believe it is important that we avoid looking at these things as zero-sum relations. Close ASEAN-Japan and ASEAN-China relations are for the good of all and for the good of East Asia in general. Prime Minister Koizumi: Regarding the question about relations and China's influence, ever since taking office, I have been saying that China's remarkable growth should not be taken as a threat. Rather, it should be taken as an opportunity for Japan. China's development and China's growth will stimulate Japan in various ways. Japan's society and economy should take China's development as an opportunity so that both of us, Japan and China, can grow. That is the view that I have been expressing ever since taking office. At this Japan-ASEAN Commemorative Summit, we have said that China's development will have a major impact on this region as a whole and we should direct it in a favorable way. China's development will lead to ASEAN's development as well as Japan's development. We should take China's development positively. ASEAN+3 involves China, the Republic of Korea and Japan and ASEAN+3 meetings are taking place every year. The development of each of us would be a benefit to the other. That is the sort of world we live in today. Deepening interdependence means mutual benefits would also increase and we should make sure that deepening interdependence will lead to mutual benefits. The fact that the commemorative summit with ASEAN was held in Tokyo this time was not because we were somewhat conscious of China. We wanted to build on the achievements of Japan-ASEAN relations over the past three decades in order to build fruitful future relations between us. If at the same time China grows, that will be a benefit for Japan and ASEAN. Mr. Tim Kelly, Bloomberg: In view of Japan's free trade agreement (FTA) talks beginning next year with Malaysia, the Philippines, also with the Republic of Korea and Thailand, is Japan willing to make concessions on agricultural products considering that these are countries that rely heavily on these products for exports for their economies? And, in order to facilitate this, is your Government willing to reform the agricultural sector at home and what kind of reforms do you have in mind? Prime Minister Koizumi: As we move ahead with FTA negotiations, each country, I believe, has very sensitive problems in agriculture. It is not just Japan. European countries and North American countries do have those problems as well. Japan is engaged in FTA negotiations with the United Mexican States, but there again, the agricultural issue is a major issue. As we launch FTA negotiations with the ASEAN countries - especially this time where we have agreed to launch FTA negotiations with Thailand, the Philippines and Malaysia next year - in the course of those negotiations, agriculture is not an issue that can be bypassed but we have to look at our overall economic relations and trade relations as a whole and not just look at agriculture. Where we should yield, we should yield; and where we should reform ourselves, we should reform ourselves. With that stance, we may need to bring our FTA negotiations to fruition. Of course, agriculture is not just an economic issue but a political issue for all countries. So we have to take that into consideration as well, and yet we have to be aware that an FTA will bring benefits to all countries concerned. With that stance, the countries concerned in negotiations should yield to each other and through that bring talks to a successful conclusion. Mr. Nishimura, TBS: A question for both leaders. In the plenary session today, North Korea's nuclear development issue and Japan's Self-Defense Forces (SDF) dispatch, I wonder how Prime Minister Koizumi explained those points and what sort of response you got from the other leaders. Prime Minister Koizumi: With regard to North Korea, of course North Korea's nuclear development program will have a bearing on this region as a whole, so I explained that I am working for a peaceful resolution. Today, Japan, the Republic of Korea, the United States and the Russian Federation together with North Korea, we are continuing our negotiations to restart the six-party talks. The first six-party talks were held earlier this year and we are now at a rather delicate moment rather the second round can be held before the end of the year or not. So behind the scenes, all countries involved are engaged in negotiations. They are making efforts. For Japan, it is not just the nuclear issue. There is the important abduction issue as well. Encompassing all these issues, Japan's stance is to strive for a diplomatic and peaceful resolution. At the same time, North Korea becoming a responsible member of international society would be a benefit for ASEAN countries as well and it is also very important for all neighboring countries. I am sure that all ASEAN leaders are aware of that view that we have. With regard to humanitarian and reconstruction assistance in Iraq, Japan's position is that we are not sending our SDF for war or to engage in combat operations. Even when we do dispatch the SDF, we do that to build a stable and democratic government in Iraq because doing so will be necessary for the Iraqi people, for Japan and for the entire world. I believe all the leaders of ASEAN countries fully understand that Japanese SDF will be dispatched for that purpose, for humanitarian and reconstruction purposes. President Megawati: To North Korea as well as to the Republic of Korea, in order to find a peaceful solution which is now underway and which has been held in China with some countries participating in the negotiation, as said by Prime Minister Koizumi, there should be a second round but we still have to find when. An Indonesian envoy is still in North Korea to encourage the Government of North Korea to accept and to really consider the terms and conditions so that the second round can be held very soon. Indonesia considers that after all the difference should be addressed in order to encourage and to find ways and try to find how to eliminate these differences so that at the end we can find an agreement and the base remains to achieve the peace in this region. With regard to the second question, Prime Minister Koizumi also explained to me that Indonesia is a nation respecting other countries. This is actually on a domestic issue in Japan and for Indonesia will of course always take part in the maintenance of peace and international security. We have actually sent our peacekeeping forces since 1956 and even now we have some peacekeepers in the Democratic Republic of Congo. Nevertheless, we take part in this peacekeeping force under the umbrella of the United Nations (UN). When I meet with UN Secretary-General Kofi Annan, he always asks Indonesia to participate actively, but we of course really have to monitor the situation post-war, and we will observe what has been done by Japan. After all, in the last meeting, Japan and ASEAN always engaged in closer cooperation, and in the future we will have to deepen and intensify this cooperation. Mr. Kornelius Purga, The Jakarta Post: My question is to Prime Minister Koizumi. Why did Japan eventually decide to sign the Treaty of Amity and Cooperation? We heard in October that Japan was very reluctant to sign it. Thank you very much. Prime Minister Koizumi: Why we decided to sign the Treaty of Amity and Cooperation this time and not in October, I think that was the purport of the question. Japan and ASEAN have long maintained friendly relations and without signing this treaty there would be no change in our friendly ties with ASEAN countries and in our policy of attaching importance to ASEAN. I have made that point very clear. However, in order to further strengthen these friendly relations that we have with ASEAN and considering that, I felt that it may be important to sign it in response to this strong request. It could carry strong symbolic meaning but with that we shall continue to carry on friendly relations. If the ASEAN countries wish us to sign the treaty, there was no reason not to sign it and to respond to their expectations I thought was a better thing for Japan to do. That is why I signed the document declaring our intention. There will be absolutely no change in Japan's policy that attaches importance to our relations with ASEAN. On the occasion of the commemorative summit this time in Tokyo, as a symbol of our intent to continue to strengthen closer ties between Japan and ASEAN, I have decided to gladly sign the document. Mr. Keiisuke Kobayashi, NHK: I have a question for both leaders and this is on North Korea. Prime Minister Koizumi, with regard to the next round of six-party talks, if they are held, what specific results would you think would be desirable? Earlier you also said the countries concerned would be adjusting the dates for the next round before the end of the year, but as time is running our for this year, I wonder what your honest feelings are with regard to the possibility of another round before the end of the year? President Megawati, I want to get your views with regard to the Japanese Government's stance. I wonder what sort of stance Indonesia will take and I wonder if your envoy has received any positive response from North Korea. Prime Minister Koizumi: First, I believe North Koreans should dispel the suspicions regarding nuclear weapons development and there should be substantive progress in this regard. That I believe is very important. For Japan, the family members of the five abductees who were returned to Japan are still there in North Korea and they should be returned to Japan as early as possible. That would be a visible and substantive response which would be conducive to better relations between our two countries, and yet to date, we have not received any concrete response from North Korea. So on this and other issues, Japan shall engage in negotiations or talks with North Korea. As for the chances of another round of six-party talks before the end of the year, obviously there are unclear points. We only have about 20 days before the end of the year and we are really at the push-or-shove point in our negotiations. I do not think that there is absolutely no possibility of another round before the end of the year. There still remains some possibility I believe. If another round before the end of the year is not possible, then I believe it is best that the next round is held as early as possible. Having said all that, we are engaged in negotiations with North Korea, with all the other countries involved as well. President Megawati: On the statement made by Prime Minister Koizumi and the issue of North Korea and Indonesia continuing to endeavor to convince North Korea and the Republic of Korea to bring their views in China, because the Government of the People's Republic of China expressed their hope to Indonesia, even though we are not actively participating in the negotiation, we have been asked to continue to contribute to at least some understanding to North Korea. As I said, our special envoy is still in North Korea. Prior to his visit to the Republic of Korea, afterwards he will return to Indonesia. I have given him some guidance also to make a visit to China to bring my message, the message that has given by both North Korea and the Republic of Korea. Journalist from Indonesia: My question is addressed to Prime Minister Koizumi. Regarding the Japan-ASEAN Commemorative Summit, it was said that it is nothing more than public relations for the Japanese side. Briefly, Japan gains more, and ASEAN, more specifically Indonesia, gains a slice or nothing. Prime Minister Koizumi: Between Indonesia and Japan, we have built up very good relations. Indonesia is an important country, not just for Japan but also an important country in ASEAN. Having met with all the leaders, heads of state and governments of ASEAN, I think it is important to consider Indonesia's development within ASEAN and also to look at Japan-Indonesia relations. We have certainly promoted cooperation in numerous areas and we shall continue to do so. Within the context of friendly Japan-ASEAN relations, I believe President Megawati believes that there is a future for Japan-Indonesia relations as well. Of course, bilateral Japan-Indonesia relations would be important for us as well. In the meeting this time with all the heads of state and government seated together, we discussed how best to build good relations between Japan and ASEAN in the future, and of course I believe that there is a future for Japan-Indonesia relations in that context.